What does it mean? 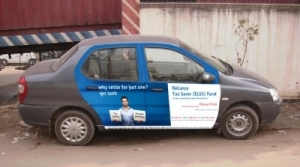 Allow advertisements on your car and in return get paid for it. Obviously, not in cash but as free petrol at allied petrol-pumps. About two years ago, I said that Himachalis lack entrepreneurship. Yet this young man of 23 years, from Shimla, is out to prove me wrong. An alumnus of St Edward’s School, Shimla and IIT (Guwahati) graduate in engineering, Raghu Khanna was inspired by one-liners on trucks and hence launched CashurDrive, a media entity that links up with potential advertisers and car-owners. 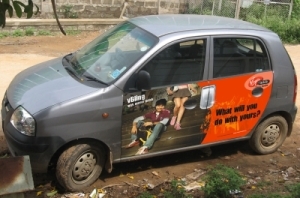 However, before going professional, the idea was mooted on an Orkut community, Brand on Wheels. What does it mean? Allow advertisements on your car and in return get paid for it. Obviously, not in cash but as free petrol at allied petrol-pumps. This way, you cannot fool around. Petrol pumps will be a check-point that you haven’t removed the ad. The vehicles will also be fitted with a vehicle tracking system (VTS) through which clients can locate their advertisements. The venture is becoming popular by the day, not only in Himachal, but across India. CashurDrive has got funding in hundreds of crore from various investors in India. How did the idea of CashurDrive come to you? One day when I was stuck in an awful traffic jam behind a truck, the funny one-liners and slogans written on it, really amused me and virtually paved the way for the CashurDrive. I thought to myself that if these funny slogans could be such attention grabbers then the effects of commercial advertisements on automobiles could be amazing too. That was when I searched the internet. I found out that no other advertising company had yet ventured or thought of this domain. Hence CashurDrive was born. Have you implemented the scheme in Himachal? CashurDrive is on the verge of cutting contracts with a number of major Himachal Pradesh based companies. We have received approvals for the dummy car wraps that we have done for these companies and are on course to implement a couple of formal orders too. It would, however, be inappropriate to name our clients for want of confidentiality and exclusivity till then. Our work will eventually show for itself. How many car-owners have registered to adorn their cars with advertisements in Himachal… and from which areas? We are getting queries and registrations from all parts of India on a daily basis. As regards to Himachal, car owners from Shimla have been the major source of online registration – 511 in all followed closely by Kangra (463) and Chamba (204). Which advertisers are there in Himachal? Advertisers In Himachal are mainly from the telecom sector as yet. Where can Himachalis who want to register with cashurdrive go and register? Himachalis, just like everyone else in India who is willing to register (for free) with CashurDrive need to log in to www.cashurdrive.com and open up their user account, which will record their personal information and contact details for us to get back to them. What’s your idea for a better Himachal? A better Himachal for me would be a Himachal that is technologically empowered to take up the challenge of venturing into newer sectors – like the one of innovative advertising that CashurDrive has taken up. This will require a greater emphasis on building up communication skills and soft skills like internet application and innovation. How would you be contributing towards Himachal? Youth from Himachal are welcome any day for walk in interviews and send their resume to jobs[AT]cashurdrive[DOT]com. We are proud to be Himachalis and would be more than willing to make Himachal proud of ourselves by providing an employment avenue to its youth. Where all is your network spread? CashurDrive is a Pan-India organization that is spread across the length and breadth of the nation with its executive teams handling the operations everywhere alike. 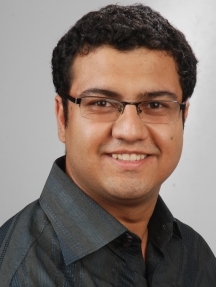 Nandan Khanna who is the Vice President – Sales of CashurDrive too happens to be an alumnus of the UIIT and MBA department of Himachal Pradesh University. Priyanka Sharma, Business Development Head, CyCloBrands, CashurDrive hails from Chamba and is Master of Arts in English from Himachal Pradesh University as well. Your advise to the Himachali youth? It would be… be fearless and courageous in pursuing your ideas and concepts, no matter how abstract or unconventional they may be. It is always out of unconventionality that newer business ideas and models are born. A perfect story-teller, who is madly in love with the hills. Shimla is his first love, and probably the last too. Won't get tired reading Rudyard Kipling. Hopes to pick up poetry again soon. Nice idea, but the car looks ugly in the picture. At least I am not sold to this idea. Could be the commercial vehicles like cabs may be the target audience but a personal car.. Never!! I have a motor bike, Can I use this technology?